Sweet Senior! Razor is a 71lb brindle male that is a real traveler. He started out racing in Abilene KS, then went to Sarasota FL, Naples-Ft Myers, Derby Lane, Orange Park and then to Daytona Beach where he retired. He never was a good racer and in 118 races only ever won 4. He kept trying though. Razor just turned 8 on May 27th so qualifies for our reduced adoption fee of $250. He is a friendly, sweet, playful boy that has been in an adoptive home with 2 other greyhounds since January of 2015. His family is having to move in with their father to take care and can't take their 3 greyhounds with them. They have asked us to re-home them. Razor has a great personality and is still a playful, silly, guy that doesn't act his age. 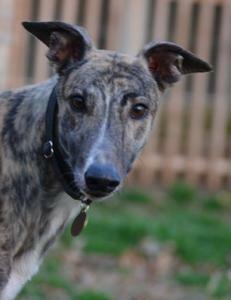 He has been living with cats and other greyhounds and is fine with small dogs. He hasn't lived with kids but has always been fine with the ones he has been around. His family thinks he would do fine in just about any situation and would be fine being placed on his own without his buddies. All three dogs have the same sire Maryville Rumble and Razor's dam is B's Katy Bee. The pictures we have of him are from when he first was placed over 3 years ago. Razor's family was able to figure out a way to keep him although they are still having to place his two housemates!